Technologies that aim to cool the planet by reflecting sunlight away from Earth or sucking carbon dioxide out of the atmosphere will be on the agenda of the United Nations Environment Assembly next week, when it meets in Nairobi. The body is poised to debate a resolution on geoengineering approaches that could be used to fight climate change, elevating a controversial issue to its highest political forum yet. 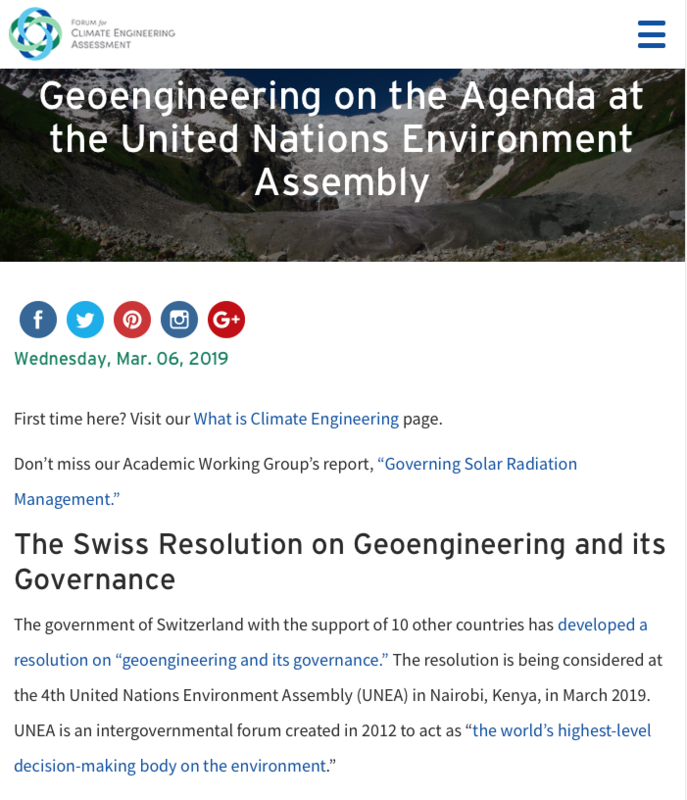 A proposal backed by Switzerland and ten other countries would require the UN Environment Programme (UNEP) to prepare a comprehensive assessment of geoengineering, including methods to pull CO2 out of the atmosphere or inject aerosols into the stratosphere to block sunlight. Due by August 2020, the report would examine the underlying science and technology, and how to govern research and wide-scale use. Preliminary discussions began this week and a final decision by government ministers could come at the end of the UN assembly’s meeting, which runs from 11–15 March. 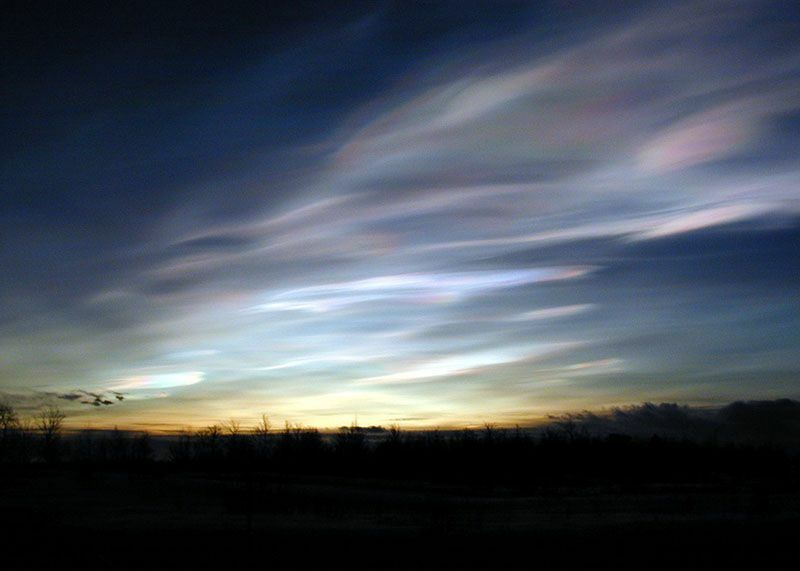 Other UN bodies have considered geoengineering in the context of specific treaties. In 2010, the 196 member countries of the Convention on Biological Diversity called for a moratorium on geoengineering technologies, citing gaps in scientific knowledge and potential environmental, social and economic risks; the non-binding decision includes exceptions for research. And in a series of decisions over the last decade, parties to the London Convention on ocean pollution have banned the commercial use of ocean fertilization — in which iron is released into the ocean to spur the growth of CO2-absorbing algae — while laying out criteria for research. But concerns about the global nature of solar geoengineering — the injection of reflective particles into the stratosphere — in particular have spurred efforts to give the governance debate more prominence within the UN. A fleet of high-flying aircraft could pump enough sulfur into the stratosphere to offset around 1.5 °C of warming for as little as US$1 billion–$10 billion annually, according to the Intergovernmental Panel on Climate Change. The relatively cheap price has spurred concerns that individual countries could eventually pursue such a programme on their own, with global consequences. Janos Pasztor, who heads the Carnegie Climate Geoengineering Governance Initiative, an advocacy group in New York City, has spent more than two years discussing the need for geoengineering governance with high-level government officials around the world. He says that a UNEP assessment would command attention and help to bring governments up to speed. “There has been no global assessment of geoengineering technologies, and this is very much needed,” says Pasztor, who advised former UN secretary-general Ban Ki-moon on climate change. But other scientists question whether a UNEP assessment of geoengineering would add anything to the global debate, given that organizations such as the UK Royal Society and the US National Academies of Sciences, Engineering, and Medicine have already produced thorough analyses. And although a UNEP assessment could spur conversations within governments, the question is whether those conversations will advance or hinder research, says Steve Rayner, director of the Institute for Science, Innovation and Society at the University of Oxford, UK. The outlook for the coming geoengineering debate at the UN Environment Assembly is unclear. The resolution faces opposition from countries such as the United States and Saudi Arabia, as well as scepticism from non-governmental groups that oppose geoengineering. “The technologies continue to be speculative, so we don’t really need a new study,” says Silvia Ribeiro, Latin America director for the ETC Group, an environmental advocacy group in Val-David, Canada. She says that the UNEP resolution discounts work done under the London Convention and the Convention on Biological Diversity, which have already produced similar assessments of science and governance issues related to geoengineering. If the UN Environment Assembly approves the resolution, Ribeiro is pushing for changes that would require the participation of representatives from civil society, indigenous tribes and others in an ad-hoc advisory committee that would advise the UNEP on the assessment. ZG Editor’s Note: Injecting sulfur aerosol particles into the sky to manipulate the Earth’s temperature is not a new idea; militaries have been using these environmental warfare tactics for decades without any regulation, public oversight, or consent.